Giuseppe Verdi (1813–1901) was one of the great masters of Italian opera. His works redefined the genre through their character-driven intensity and taut dramatic structures. The sheer size of his output is extraordinary; every one of his 28 operas is distinct and original, and many are among the most performed operas in the world. Verdi’s first opera Oberto, conte di San Bonifacio (1839) did reasonably well at its premiere at La Scala, Milan, but his second, the comedy Un giorno di regno (1840) was such a fiasco the whole run was cancelled after only one performance. Fortunately, the impresario at La Scala held a disconsolate Verdi to his three-opera contract and encouraged him to resume work on what would become Nabucco (1842). The opera was a triumph, the 1842 autumn revival running for a record 52 performances. 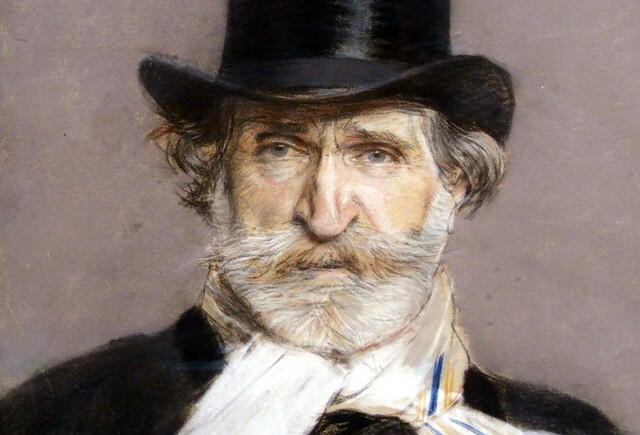 It marks the emergence of Verdi’s unique voice, with complex central characters, driving rhythmic energy and a dynamic use of the chorus – most famously in ‘Va, pensiero’. I Lombardi alla prima crociata (1843) was much along the same lines as its predecessor. It was received with rapturous enthusiasm but today is often seen as Nabucco’s poor relation. Verdi craved a break from the large chorus-led operas he’d written for La Scala, and a commission for the smaller, more intimate stage of La Fenice, Venice, offered him the perfect opportunity. Ernani (1844) marks a turning point, displaying the intense focus on intimate, personal conflicts that characterizes Verdi’s later output. It was also the first of many operas Verdi wrote with librettist Francesco Maria Piave, and, true to the whole of their career, Verdi bullied his obedient librettist with countless exacting demands. Their next collaboration, I due Foscari (also 1844), continued in Ernani’s intimate vein; it also sees Verdi experimenting with imparting a strong sense of place through his music, another future hallmark. His next two operas returned to the style of Nabucco: Giovanna d’Arco (1845), back at La Scala, is primarily a soprano showcase; and Alzira (also 1845), for the illustrious Teatro di San Carlo in Naples, received a lukewarm response and was late called by Verdi ‘proprio brutta’ (really ugly). The composer returned to La Fenice with Attila (1846), which again was coolly received – partly due to the patchwork libretto, worked on by both Piave and Verdi’s La Scala librettist, Temistocle Solera, and sitting somewhat uneasily between the large-scale and the intimate. The following year, 1847, saw Verdi’s first commissions from outside Italy. First came Macbeth, arguably his first true masterpiece. Verdi was obsessive about his adaptation of Shakespeare’s tragedy, for Verdi ‘one of the greatest creations of man’, and brought in his friend Andrea Maffei to rewrite some of the long-suffering Piave’s text. Verdi’s scrupulous attention in rehearsals paid off in a premiere that was one of his greatest successes. He returned to the opera in 1864 for a production at the Théâtre Lyrique in Paris, inserting several new numbers including Lady Macbeth’s show-stopping aria ‘La luce langue’. I masnadieri, for Her Majesty’s Theatre, London, gathered some of the best singers of the day for a fabulous gala premiere attended by Queen Victoria, but has since struggled to find its place in the repertory. For the Paris Opéra Verdi adapted I Lombardi into Jérusalem, making major structural changes, adding much new material and cutting and rearranging the rest. Despite the considerable advances on its predecessor, Jérusalem never managed to oust I Lombardi in Italy. 1848 saw the premiere of Il corsaro, again to a Piave libretto. It was poorly received and is now rarely performed, though the heroine’s Act I aria ‘Non so le tetre immagini’ has become a popular concert piece. The 1848 revolutions across Europe – and particularly in Milan – inspired Verdi to write the patriotic La battaglia di Legnano (1849), and its political focus is a precursor to many of Verdi’s later works. By the time of the premiere at the Teatro Argentino, the Austrians had reoccupied Milan, but the opera was still a great success, with the whole last act being encored. As would become common with Verdi’s operas, La battaglia di Legnano fell victim to heavy censorship, particularly in the virulently anti-revolutionary era in the 1850s, and fell from the repertory. The end of 1849 saw the premiere of Luisa Miller at the Teatro San Carlo. With its subtle dramaturgy and hint of formal experiment, it’s another important bridge from Verdi's early work into his fruitful middle period. From Stiffelio (1850) on, Verdi’s operas exhibit the confidence and control of his full maturity. This so-called middle period produced many of his most popular works. Piave’s libretto for Stiffelio shocked censors and audiences alike with its contemporary story about a Protestant pastor who realizes his wife has been unfaithful. The opera contains some impressive music, particularly the final scene, but was beset with censorship problems and was rarely performed. But when it came to Rigoletto (1851), Verdi furiously held his ground against censors wanting to tone down the authority of the count and restructure the title character’s personality altogether. The immediate and immense popularity of Verdi’s music defied all censors – Rigoletto was an instantaneous success, seen more than 250 times in the first ten years. It remains one of Verdi’s most performed operas, its many brilliant melodies including the Duke’s inescapably infectious aria ‘La donna è mobile’. Il trovatore (1853) was originally conceived as a kind of sequel to Rigoletto, with a mother — Azucena — torn between love for her foster-son and the desire for revenge. Though Verdi had encouraged his librettist Salvadore Cammarano to be experimental, the libretto is in fact quite traditional and the opera itself has a strong formal design. Il trovatore was a huge success from its premiere and became Verdi’s most performed work, famed particularly for the thrilling Anvil Chorus, among countless other numbers. La traviata (1853) followed hot on the heels of Il trovatore, their premieres separated by a scant two months. Piave supplied the libretto, which again raised hackles with the censors over its courtesan heroine. The premiere was a total disaster, principally due to the unsuitability of the lead singers. Verdi, deeply hurt, was reluctant to allow further performances, but a new production at the Teatro San Benedetto in Venice was an unequivocal success and the opera has since never left the repertory. Verdi’s sympathetic realization of his heroine Violetta Valéry, and a wealth of great tunes, including the Brindisi ‘Libiamo, ne’ lieti calici’ and Violetta’s aria ‘Sempre libera’, have ensured the opera's enduring popularity. In all his remaining operas Verdi geared his formidable skills towards constructing bold, imposing works, ambitious in scope but retaining the sense of intimate drama. First up was Verdi’s return to the Paris Opéra. Les Vêpres siciliennes (1855) is a French grand opera that follows the strict rules of the genre to the letter. The taxing roles make it a challenge for any opera house and productions today are a relatively rare treat. Simon Boccanegra (1857) was a commission for La Fenice and was not well received, the convoluted plot in particular coming in for some harsh criticism. Verdi returned to it in 1879, encouraged by Arrigo Boito who had reworked Piave’s libretto. They created an entire new scene – the Council Chamber scene that ends Act I – and made numerous small alterations to individual numbers. The result, first performed at La Scala in 1881, was a tremendous success. Aroldo (1857) was Verdi’s attempt to rehabilitate the controversial Stiffelio; he and Piave relocated the story to 13th-century England and transformed the hero into a crusader. The result loses some of its predecessor’s intensity but is remarkably stylistically consistent, indicating how forward-looking Verdi had been with Stiffelio. Un ballo in maschera (1859) was originally written for the Teatro San Carlo – but furious arguments with the stringent Napolese censors led Verdi to offer it instead to the Teatro Apollo in Rome. Verdi was still forced to make some concessions, relinquishing the story of the real King Gustave III of Sweden for a fictional setting in Massachusetts with Riccardo ‘Governor of Boston’, though many modern productions revert to Verdi's original setting. The opera brilliantly melds Verdi’s Italian style with the French model he had refined in Les Vêpres siciliennes. After the premiere of Un ballo in maschera, Verdi insisted to friends that he had retired – but he couldn't refuse a commission from the Imperial Theatre in St Petersburg. La forza del destino (1862), Verdi’s last collaboration with Piave, wasn’t much of a success on its premiere and Verdi took the opportunity to introduce some major revisions for the 1869 La Scala premiere, replacing the very bleak ending with one that offers at least some promise of salvation. La forza del destino is not often performed, largely due to the extreme difficulty of the three main roles and the massive forces required. It is best known for the overture of the 1869 version and the ‘fate’ motif that stalks the score. A major new commission from the Paris Opéra led to one of Verdi’s grandest creations – eventually. Verdi worked on Don Carlos (1867) with the French librettists Joseph Méry and Camille du Locle through 1866. Only a month before the premiere it became apparent there was simply too much music and some major cuts were introduced. The opera was even more heavily cut for subsequent performances in Italy. For an 1884 La Scala production Verdi cut the opera’s first act – and then reinstated it for an 1886 Modena production, keeping many of his earlier revisions. Verdi was never entirely satisfied with Don Carlos, but this thrilling opera on idealism and the abuse of power is now seen as one of his finest. Once again Verdi declared that he had retired, but he was inspired by a scenario by the Egyptologist August Mariette sent to him by Du Locle. Aida (1871) was written for the Cairo Opera House. The premiere was delayed by the Franco-Prussian war so missed the actual opening of the new opera house – but when it was finally seen it was a triumph. Verdi, however, had chosen not to travel to Egypt and took more interest in the La Scala 1872 premiere, which was also a great success. By the standards of Verdi's late work Aida is relatively conservative (particularly in its grand choruses and ballet), but, almost more than any other Verdi opera, it is striking for its distinctive sense of place, thanks to his innovative orchestration and melodic writing. Verdi retired in earnest after Aida, devoting himself to farming and charitable work. The publisher Giulio Ricordi kept pestering him with ideas, and finally he and Boito piqued Verdi’s interest in 1879 when they suggested an opera based on Shakespeare’s Othello. Boito produced a libretto by the end of that year, but revisions to Simon Boccanegra and Don Carlo came first. Otello (1887) was an immediate success on its premiere and remains one of the most widely respected works in Verdi’s canon. It is one of the masterpieces of his late style, with long passages of through-composed music as well as more traditional arias and duets. Verdi inserted a ballet for the opera’s 1894 premiere in Paris, but this section is rarely performed today. Verdi closed his career with another Shakespeare adaptation – this time a comedy, his first since Un giorno di regno. It was Boito who suggested the source, The Merry Wives of Windsor, with material from Shakespeare’s Henry IV plays, and he and Verdi worked on the libretto throughout 1890. As with Otello, Verdi took some time to write the score. But he had his reward in Falstaff (1893), another hit from its premiere. The score is striking for its quicksilver changes of mood and for its musical and verbal invention – nowhere more so than in the closing fugue ‘Tutto nel mondo è burla’ (All the world’s a joke). And so Verdi brought to a close his long career, over which his name had become synonymous with Italian opera. It remains so to this day, thanks to the beauty, individuality and brilliance of his masterpieces. Macbeth runs 25 March - 10 April 2018. Tickets are still available. Falstaff will be performed in Summer 2018. Find out more. That you for this article on Verdi. In all that I have read about him, this is the first that I have learned that he became a farmer and was devoting his time to charity causes. He really was quite a character. Yet again no mention of the man who, according to the music press, was the greatest Verdi tenor of the 20th century - namely Carlo Bergonzi. During the late 60s to mid 70s I heard them all - Pavarotti, Domingo, Careras, Vickers, Aragall and many others. Bergonzi was in a class all his own. Thank you for this informative article. Have now performed two Verdi roles and 2 productions in professional chorus. Now hoping to perform the other roles I have! Kind regards.